The Ian Gillan Band needs no introduction and their history is well documented after Ian left Deep Purple and formed IGB who then split up in 1978 and Ian then joined Gillan. Ray Fenwick along with John Gistafson, Mark Nauseef, Colin Towns and Ian Gillan were IGB and Ray has supplied these tracks from his personal archives and provides here over 60 minutes of rare, alternative versions and previously unreleased tracks which are a must for IGB fans all over the world. Ray has overseen the mastering as well as providing rare band photos from his own personal collection. Ian Gillan Band’s music was a fusion of many styles from rock to jazz funk. This CD is a unique opportunity to hear rare music from a 1970′s supergroup. Roger Glover co-wrote and played on 4 tracks. With an informative 12 page booklet written by Jerry Bloom, editor More Black Than Purple, this CD is essential listening, both for fans and for lovers of great musicianship and the heavy rock genre in particular. …guitarist Ray Fenwick has raided his vaults for this excellent set, and come up with some real gems. Not only are there plenty of alternate versions…and backing tracks, but several numbers unreleased in any form…Essential. A great CD package with very informative sleeve notes by Jerry Bloom. 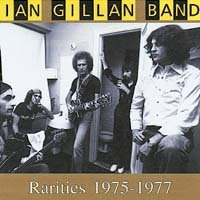 A must for Gillan fans and anyone who likes the varied sounds that were 70s rock. There's a sense of adventure that latter-day Purple could never have countenanced and a looseness to the proceedings that was a far cry from the uptight grumbling that scarred his old band's final sessions together. If it all gets too weird for you, there's a terrific version of 'Child In Time' to bring you back to earth. He may have gone on to find a winning formula with Gillan but these experimental sounds are interesting nonetheless with Gillan's tonsils twisting this way and that!